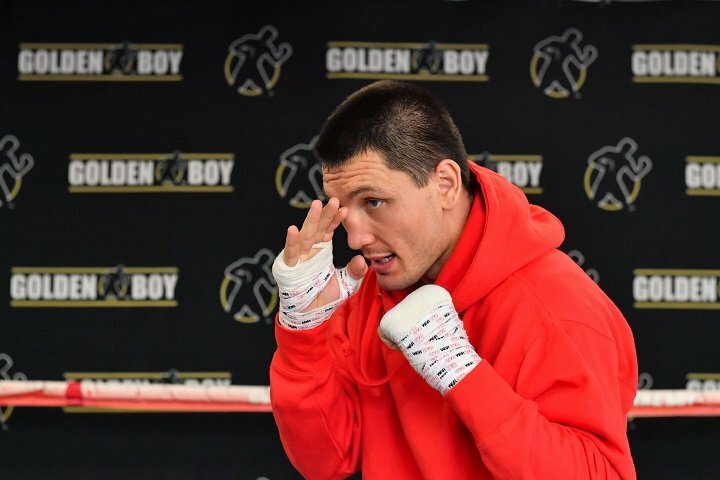 WBC USNBC Light Heavyweight Champion Vyacheslav “Lion Heart Chingonskyy” Shabranskyy (19-1, 16 KOs) hosted a Los Angeles media workout at Westside Boxing Club ahead of his 12-round fight against former unified Light Heavyweight Champion Sergey “Krusher” Kovalev (30-2-1, 26 KOs) for the vacant WBO World Light Heavyweight championship. The fight will take place on Saturday, Nov. 25 at the Theater at Madison Square Garden and will be televised live on HBO World Championship Boxing® beginning at 10:00 p.m. ET/PT. Kovalev vs. Shabranskyy is a 12-round fight for the vacant WBO World Light Heavyweight championship promoted by Main Events andKrusher Promotions in association with Golden Boy Promotions. Barrera vs. Valera is a 10-round light heavyweight fight promoted by Main Events in association with Shuan Boxing Promotions. Gamboa vs. Sosa is a 10-round super featherweight fight promoted by Golden Boy Promotions in association with Peltz Boxing and ZR Entertainment. The event will take place at the Theater at Madison Square Garden in New York City, and will be televised live on HBO World Championship Boxing beginning at 10:00 p.m. ET/PT. Tickets for Kovalev vs. Shabranskyy range from $50 to $350 and are available online at Ticketmaster.com, at the MSG box office or Main Events’ office by calling (973) 200-7050 or emailing boxing@mainevents.com. Use the code LATINOSUNIDOS when purchasing your tickets to donate a portion of the proceeds to hurricane relief efforts in Puerto Rico and the rebuilding efforts in Mexico following the earthquake in Mexico City. The donations will go to the Hispanic Federation’s Unidos fund and to Habitat for Humanity Mexico.